I just wanted to share information about a new children’s book written by the Potomac Highlands CWPMA, “The Pests that Girdle the Home of Tucker the Turtle.” The star of the book is Tucker, an Eastern box turtle who was born and raised in WV. Through the telling of his story, Tucker shares the changes that he has seen as non-native invasive species have spread across his home. Spring wildflowers are disappearing, trees like native hemlocks are dying, and many strange, new critters have taken up residence. Tucker shares his experiences with fifteen different invasive species including insects, plants, and even a fish! I am also attaching a few pages from the book for your information: Tucker_Snippet. More information can be found on the CWPMA’s Website at http://www.phcwpma.org/tucker. 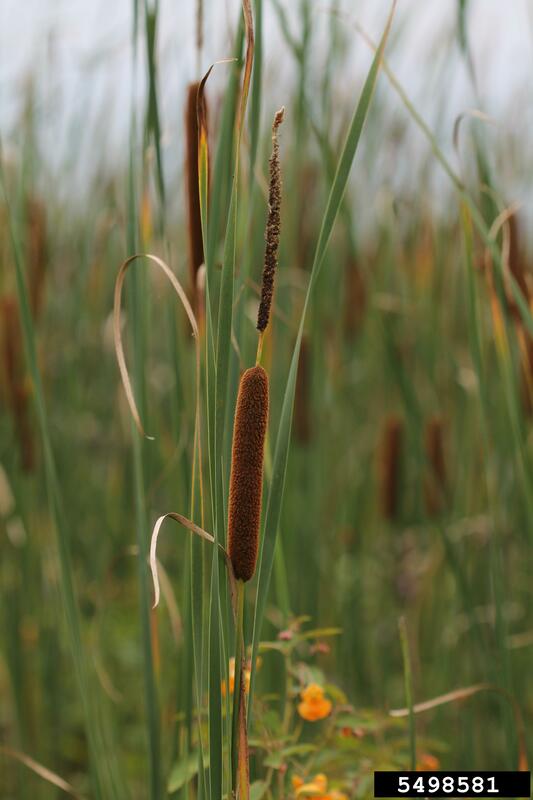 The unique feature of the velvety, brown cigar-shaped flowers and long, lanceolate leaves of the cattail are a common observed sight throughout Ohio wetlands. Cattails have long been known to play an important role as food source and shelter for some marsh-dwelling animals. However, with the invasion of the non-native cattail Narrow-leaved cattail, this no longer holds true because this plant species will exclude some less common species. It quickly invades freshwater marshes, wet meadows, roadsides, and ditches. The Narrow-leaved cattail (Typha angustifolia) was introduced to the Atlantic seaboard from the dry ballast of European ships. Since this introduction, it has quickly spread westward and occurs throughout the United States. The non-native invasive Narrow-leaved cattail is similar in appearance to our native Broad-leaved cattail (Typha latifolia) and their habitats overlap in many areas. This erect, aquatic freshwater perennial inhabits wetlands, river backwaters, bogs, fresh or brackish marshes, road sides, ditches, lakes and ponds. Cattails can quickly dominate a wetland plant community and produce monotypic stands that reduce the overall habitat value. Their roots produce dense rhizome mats and clustered leaves produce thick litter layer that may reduce the opportunity for other plants to establish or survive. There are fewer insects and other invertebrates in monotypic stands of cattail. The Narrow-leaved cattail is also allelopathic, producing chemicals which discourage growth of other plant species. The long, linear leaves of the Narrow-leaved cattail emerge in the spring. The blades are .15-.5 inches wide, up to 3 feet long, dark green, and rounded on the back of the blade. There are 15 leaves per stock. The flowers mature in mid-summer and are comprised of velvety brown, cigar-shaped spikes that are 2-6 inches long with a gap of .5-4 inches between male and female flowers. Each spike can produce approximately 250,000 seeds in the fall that are dispersed by wind. These seeds can remain viable in the seed-bank for up to 100 years. It can also reproduce vegetatively by means of starchy underground rhizomes that form large colonies. The Narrow-leaved cattail can reach 3-6 feet tall and thrives in nutrient rich or slightly saline soils. Narrow-leaved cattail is considered to be a riparian dominance type that limits diversity in many wetland areas. Many wetlands that once contained a diverse habitat for wetland wildlife now have solid stands of Narrow-leaved cattail. Control can be an important consideration in these natural areas.